A look at Bike Arkansas guest editor Dane Eifling's daily commute in Fayetteville. Dane Eifling reflects next to the newest mural at the Fayetteville Town Center. As I step out of the house this morning I am presented with two options. I can ride my bike to work, or I can drive. My bike is parked right next to the car in the carport. My keychain holds keys to both vehicles. I could easily choose the car key, but I opt for the key to my bike lock instead. The choice today, as it is on so many other days, is an easy one. The car will stay in the carport while I pedal out of the driveway, down the street and toward my office. The decision to ride to work is made easy because of three main reasons. First, I like to ride more than I like driving. I enjoy the feeling of leaning into turns and the wind on my skin. The exercise I get pedaling up hills gives me a nice boost of endorphins to start my day. I experience a richness of detail in my surroundings—sights, sounds and smells that I just can’t get in a car. Second, it’s just more practical to ride a bike. A car is a bit unwieldy for a trip of only 2.7 miles. Biking costs less and doesn’t take much more time. It takes me 11 minutes door-to-door when I drive to work and 15 minutes when I bike. The time saved by the car doesn’t come close to matching the benefits of biking. Third, my job and my community make it easy to ride. I work in downtown Fayetteville, which is just a few blocks from the Razorback Regional Greenway. But my usual route from home is entirely on-street. While sharing the road with automobiles certainly requires some measure of competence, Fayetteville drivers are accustomed to sharing the road and are almost always courteous and respectful. I’m thankful to have this option. I know many people have little or no choice when it comes to their transportation. It’s the car or nothing. For these people, obstacles such as not owning a bike, living too far from work, physical limitations or hazardous roads can all but rule out anything but driving. I’ve made deliberate decisions that help make everyday biking for transportation a more viable option. I’ve chosen to raise my family in the middle of town, for instance. I’ve chosen to invest in a quality bicycle, and I’ve landed a job at a bike-friendly place of employment. But all of these larger decisions don’t force me to put away the car keys. They only make it feasible for me to ride. 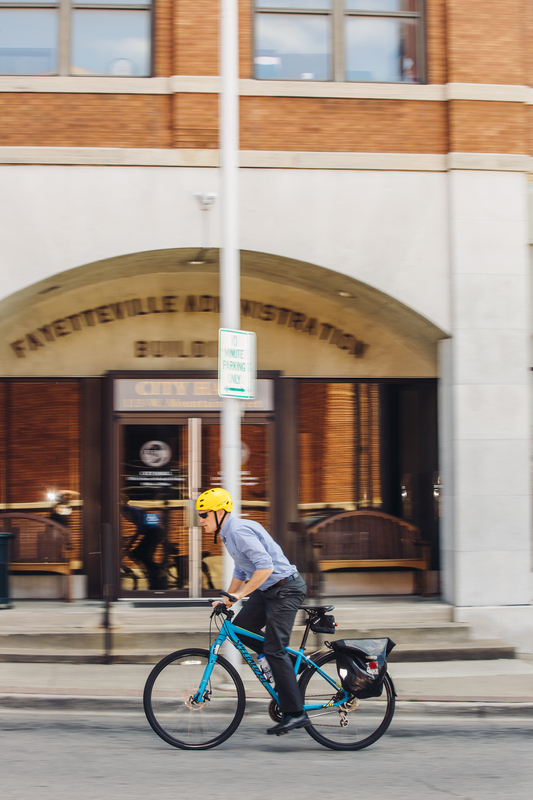 My job as bicycle programs coordinator for the city of Fayetteville is centered on making the same transportation option that I enjoy available to more people in Fayetteville. My job affords me the opportunity to learn about my community from the inside out and see behind the scenes of city government. It also allows me to explore my community in the best way possible—by bicycle. I have a little extra time this morning, so I swing into my favorite new coffee shop, the Arsaga’s at Church and Center, for a fancy “toast” and some iced tea. I’m able to conveniently prop next to the entrance. I like stopping in local businesses like this one because I’m able to get a unique experience and I inevitably run into an acquaintance or see a familiar face. The Fayetteville Farmers’ Market offers me another convenient opportunity to stop for fresh local produce. Today I’m just getting a lavender plant for my wife’s garden. I often hop on my bike to go to a nearby meeting or to teach a class. I use my bike for utility but I still very much enjoy my time riding. On the weekends I might take a pleasure ride with friends, but we always have a destination. We’ll take a scenic route to an event, restaurant or store. We don’t keep score by tracking our speed or number of miles. Biking, the way I do it, is not a sport. It’s just how I get around. I don’t wear any special cycling gear—no special shoes or lycra shorts. Biking is an integral part of my lifestyle, but I do not consider myself a “cyclist” any more than most people consider themselves “motorists,” I’m just a regular guy from Fayetteville who rides a bike.